Kutaisi will host its first International Opera Festival on September 16-22 at Kutaisi Meliton Balanchivadze Opera and Ballet State Theater. The aforementioned festival is a joint project of Kutaisi M. Balanchivadze Opera and Ballet State Theater and the International Fund - World Talent”, established by the famous Georgian singer Davit Ghvinianidze. 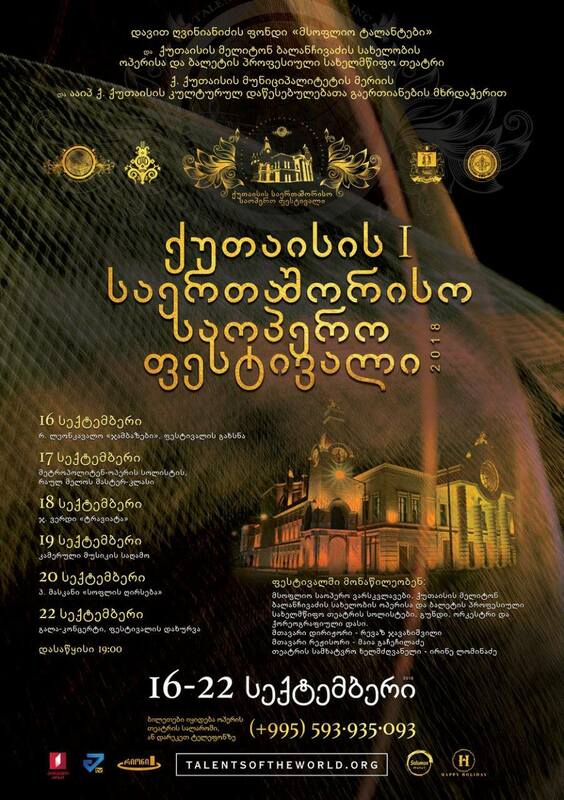 The festival is supported by the City Hall of Kutaisi Municipality and the Union of Cultural Institutions of Kutaisi. Artists performing at the international festival consists of world renowned Georgian and international musicians: Tamar Iveri, Raul Melo, Maria Pakhari, Larisa Andreeva, Alexander Kireev, Konstantine Suchkov, Sulkhan Gvelesiani, Marika Machitidze, Irakli Murjikneli, Giorgi Tsintsadze, Akaki Ioseliani. The singers will take part in a variety of shows such as: Ruger Leonkavallo's "Clowns", Giuseppe Verdi's "Traviata", Pietro Mascan's "Role of the Village", ending the festival with a Gala Concert. Additionally, Raul Melo – a soloist at the New York's Metropolitan Opera will hold a master class for younger musicians. The role of the main conductor of the festival is assigned ro Revaz Javakhishvili, whereas Maia Gachechiladze, assumes the role of the managing director. September 19 - The evening of chamber music, participating: Larisa Andreyva, Maria Pakhari, Marika Machitidze, Alexander Kireev, and David Gvinianidze. Concerts - Temur Eliava, Mariam Lolua. Performances and concerts start at 19 o'clock.